Believe it or not, Hamburg garbagemen-turned-amateur-photographers have managed to convert trash bins into massive pinhole cameras, all in an effort to capture the city they love and keep clean every day. The photos, developed in a makeshift lab which you can see here, are almost a square meter in size, and as you can see below, the results are nothing short of miraculous. 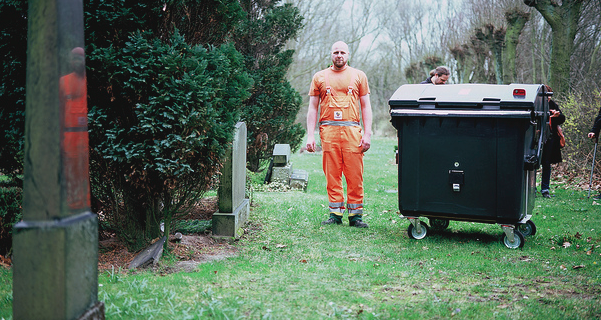 With these cameras the binmen take pictures of their favourite places to show the beauty and the changes of the city they keep clean every day. The Trashcam Project was developed by Christoph Blaschke, Mirko Derpmann, Scholz & Friends Berlin and the Hamburg sanitation department. Special thanks to Hamburg based photographer Matthias Hewing for his professional advice and the challenging lab work with the giant negatives. “The fun fair “Dom” in Hamburg photographed with a garbage container by garbageman Bernd Leguttky, Christoph Blaschke and Mirko Derpmann…”.